Welcome to the 2013 edition of Astro Oscars, where we let the stars pick the stars who win! That’s right, we don’t have to endlessly peruse statistics, corner Academy members, make our own guesses or even trust Harvey Weinstein’s considerable clout: no, the very patterns of the heavens will tell us the winners. We all live within a matrix of greater energies, cyclical cosmic patterns which begin at the moment of birth and continue throughout our lives. 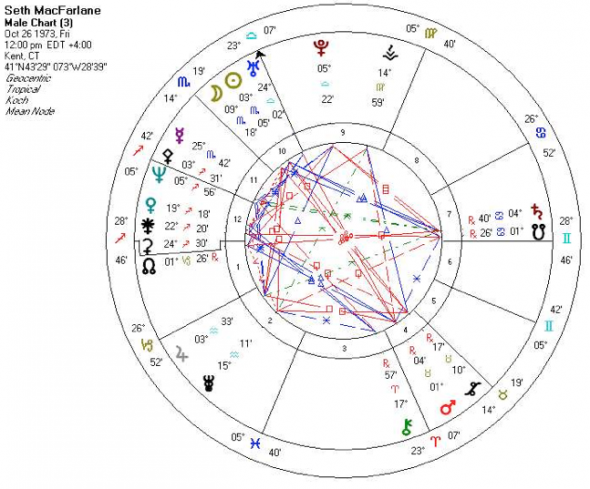 Good fortune and honors tend to occur when patterns are harmonious, as they were in Meryl’s astrological chart in 2012. Despite Viola Davis’s status as the favorite in the race, her energetic aspects were not as favorable, and those things are clear to the professional astrologer. So relax and come along for the ride as we see once more what the stars above are saying! We first notice that most of the planets are on the right, or western side of the chart, indicating that cooperative themes will be spotlighted. The solitary hero is out of luck this year. 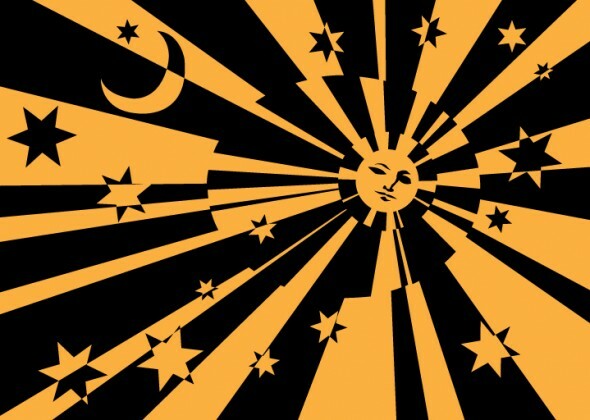 Indeed, the Sun, representing the ceremony’s sense of identity, is in the 7th House, associated with partnerships. While this is the case every year, with the ceremony beginning just before sunset, this year the Sun has some planetary company in this sector. This says that relationship movies and conflictual “us vs. them” themes have a central place in this year’s show. The ceremony used to be held in late March, but was moved up in order to shorten the seemingly interminable Oscar campaigns. With the shift to late February, the Oscars’ Sun-sign changed from Aries to Pisces—fire to water. The celebs may shiver more in their skimpy gowns, but the compensation is that the energy of the show seems more in alignment with old-time glamour and the “magic” of Hollywood. Pisces, after all, is a sign associated with the imagination. Its ruling planet is Neptune, which in this year’s chart is transiting near the Sun (as it will be for the next three years or so) and is also in its own sign. Neptune is associated with creativity, spirituality, dreams and glamour. Fantasy films, or those with a lighter touch, do well under this aspect, as was evidenced last year with “The Artist” winning Best Picture under a frothy planetary alignment. This year’s chart has that same (often very confusing but creative) Neptune-Sun aspect, but here it also straddles the 7th House cusp—the point given in astrology to marriage and relationships, war and peace, and direct dealings with others. This seems to correlate with several movies nominated, such as Lincoln, Silver Linings Playbook, and Amour. And the Moon, a few hours from being full, has just risen and inhabits the 12th House, which in astrology is given to secrets, clandestine activities, caregiving, suffering, confinement and subconscious habit patterns. Let’s see—that describes, wholly or in part, Argo, Zero Dark Thirty, Life of Pi, Beasts of the Southern Wild, Les Miserables and Django Unchained. And the Moon’s cruising through late Leo, a sign associated with leadership—also a theme this year. It’s no accident that, under these energies, serious dramas take the limelight now rather than lightweight fare. Expect one of them to win Best Picture. This year’s ceremony takes place under a Mercury Retrograde, so glitches and misspoken speeches may be part of the milieu. Jupiter, planet of expansion and good fortune, sits prominently in the 10th House of social status and reputation. Jupiter also rules ethics and the law, and several films concerned with legal issues were nominated this year…Lincoln, Argo, Zero Dark Thirty, Django, Les Miz…you get the picture. Saturn, planet of hard work, frustrations and accomplishment through sustained effort, sits in the 3rd House of communications. Make sure you have a pillow handy, because this says the ceremony will be as long as ever. Saturn also rules history, and several hard-hitting historical dramas made the cut. Mercury (communications) is also hanging out with Mars (god of war), in the 7th House of partnerships. The word “gritty” comes to mind. Hearts-and-flowers films are a bit out of place this year. 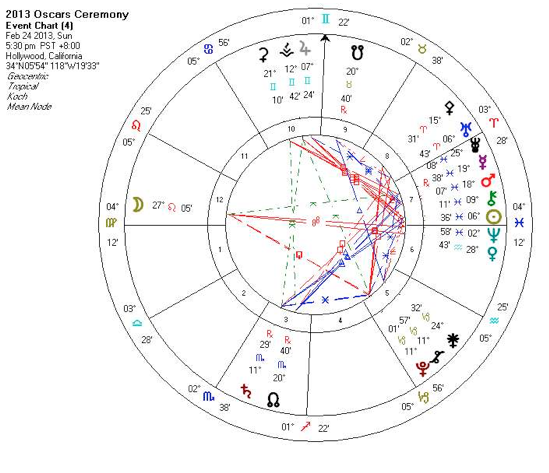 MacFarlane’s birth time isn’t known, but we have a good idea of how he’ll perform as an Oscar host by looking at his current astrological aspects and then comparing them to the chart of the ceremony. His Sun and Moon both reside in Scorpio, as MacFarlane was born a few hours after the monthly New Moon. Scorpio, passionate but often prickly, is known for its sarcasm and somewhat secretive nature. Passion and power issues are usually featured prominently in the personality. With an exact square (tough 90-degree angle) between Saturn, ruler of hard knocks and authorities, and Pluto (power/secret obsessions) his humor seems born out of frustration, pain or cynicism—and “Family Guy” certainly is subversive in its absurd portrayal of social issues. What is the character, Stewie, if not arrogance and power issues personified? Very Scorpionic, eh? But Jupiter square his Sun/Moon gives MacFarlane a lighter touch and says he can make fun of ANYTHING—including, perhaps, his own personal issues. His chart has been under major strain lately, what with Saturn in his Sun-sign and with it currently hanging out close to his Moon. That’s like going into a bar to relax and ending up in a corner without your wallet and with a black eye from that sultry woman’s boyfriend. It’s lots of responsibility issues, stern emotions and possibly some depression. MacFarlane may never have been as serious in his life as he is now—transiting Saturn, Uranus and Pluto are all pressuring him energetically—but hey, that can be highly motivating, too! A gig as host of the Oscars can certainly be a game-changer. The Moon in Leo on Oscar night sits on MacFarlane’s Ascendant and makes a flowing angle to his Venus in light-and-lively Sagittarius, so his personal attractiveness is enhanced now. His Scorpio Sun/Moon combo and his Saturn in Cancer (emotional sensitivity) makes a harmonious Grand Trine to the Oscar chart’s Pisces Sun, meaning that things should go relatively smoothly. However, Mercury Retrograde reminds us that mistakes will probably be made. I see at least one controversial quip MacFarlane makes, or a misbegotten speech by a nominee or presenter—and it wouldn’t surprise me if someone mistakenly called out the wrong name when the envelope is opened. It looks like Seth MacFarlane is a competent, if not especially memorable, Oscar host. 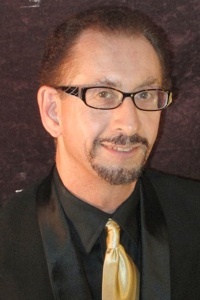 He may go into the books like David Letterman—interesting experiment for the producers to try ONCE. In short, Billy Crystal won’t have to worry about his Oscar hosting legacy. Next Up: Fearless Astro-Predictions for Best Supporting Actress and Best Supporting Actor!